This article is part of a continuing series examining the postseason prospects of the eight seven six five four three two remaining MLB playoff teams in 2013. 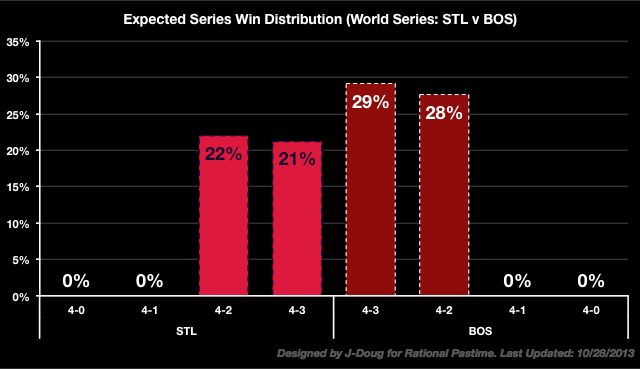 The Boston Red Sox took one on the road against the St. Louis Cardinals, and now we're right back where we started: series tied, one extra game in Boston (if necessary), aces pitching tonight and a 57-43% lead for the Red Sox in World Series probability. This is about as close to "It's a brand new series!" as it gets. The updated progressive WS% chart fixes an error from earlier where I forgot to account for the off day between World Series Games 2 and 3. With two of the three remaining possible games in Boston, the Red Sox now have a 5% home field advantage. In other words, if two of the three remaining potential games were in St. Louis, the Cardinals would currently enjoy a 53% chance to win it all. So it goes in the modern MLB. After tonight's game, regardless of outcome, Boston will enjoy a double digit home field advantage. 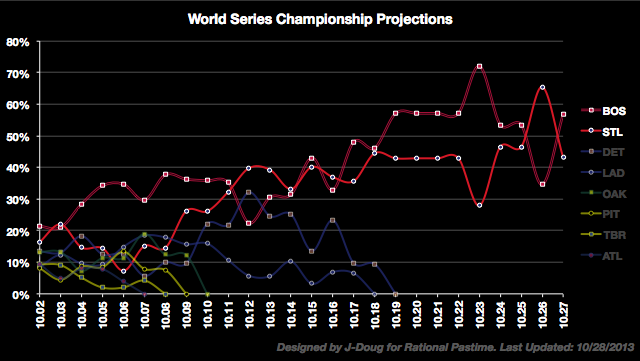 Check out the breakdown of individual World Series outcomes below. With Boston's win, St. Louis' most realistic chance at winning the World Series is to sweep the next two games (although those odds aren't drastically better than winning in seven). A Boston win in seven is now the most likely outcome. In fact, there is a 57% chance the Red Sox clinch a World Series victory at home—something that hasn't happened since the second Woodrow Wilson administration. You'll note above that Boston and St. Louis' expected win percentages, according to Pythagenpat, are rather similar. Boston's real advantage in the ratings system is a net bonus of .014 points due to the AL advantage in interleague play, as well as a .019 advantage in their Elo rating. Boston enjoys that lead due to their tougher schedule. Boston's opponents averaged an eAVG of .512 this season (6th in MLB), whereas St. Louis' opponents averaged .500 (tied-19th in MLB). In other words, Boston amassed the same number of wins as St. Louis with a similar run differential, but did so in a tougher league against tougher opponents. Thanks for reading. Tune in Wednesday for an update following a pivotal Game 6 of the 2013 World Series.